Each year IOTA will identify at least two occultation events in North America as special observing campaigns for the year. One event will be chosen for the potential to generate the most valuable results, and the other event will be chosen as the most “observable”. We encourage IOTA observers to put these events on their calendar. Given the high priority for these events, we expect some observers will travel to observe these events. Prior to each event, someone in IOTA will post messages to the Yahoo group informing everyone of the weather prospects and possible preferred locations for observers. 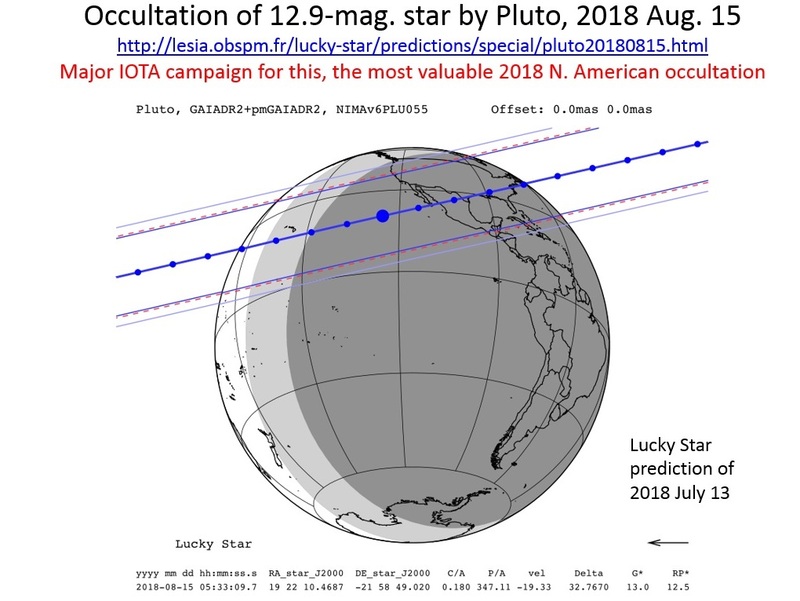 http://lesia.obspm.fr/lucky-star/predictions/special/pluto20180815.html It gives the meanings of the different lines shown on the map above. The path is expected to cross North America and Central America around 5:30 UT with a maximum duration of about 126 seconds. Please go to the Lucky Star Website given above for important information for how to observe the event, and report your observations of it. A brief description of the goals for the Pluto observations: PlutoGoals. This occultation by (80) Sappho is the North American “most observable” event for 2018. More details can be found at http://www.asteroidoccultation.com/2018_09/0916_80_56486.htm and via OccultWatcher once the event appears there.